A quickie from me today, again! I am busily working on things I can't share yet, so thought I would show this card I made for the Hochanda TV Show. 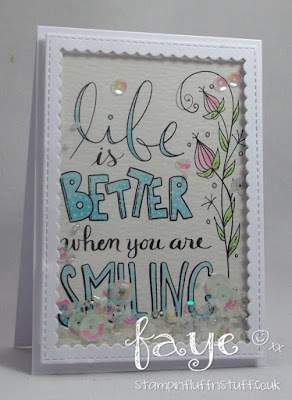 I used a Taylored Expression Watercolor Panel from Dies to Die For, which made for a super quick, easy and pretty card. Just what you want when you are against the clock. Sorted! This is gorgeous Faye, love the quote.